12 is the Tone of Understanding. This is day when disassociated parts come together and a Revelation of Truth sinks in. Tone 12 holds the energy for reflection that allows for a new Realization. The Revelation 12 prophecy aligning today, on September 23, 2017, magnifies the “understanding energy” of Tone 12. Angel number 1212 symbolizes spiritual growth and awakening, manifestation of dreams, and awareness as an Infinite Being. This is a number that encourages a positive frame of mind, steering thoughts in the direction of your Highest Aspirations. A life-changing experience, heightens the possibilities of Instant Manifestation. Imagine your Dream as if it already exists. 12 resolves to 3 (1 + 2 = 3), so we also recognize the Number 33. 33 reflects the energies of the Ascended Masters, and indicates that we are surrounded by a Divine Agency, and guided by a Master Teacher who resonates with the energies of compassion, blessings, inspiration, honesty, discipline, bravery and courage. Number 33 tells us that “all things are possible.” Divine Support is close at hand, asking us to focus on the Divine spark within our Self and Others, and is also assisting with the manifestation of our Dreams. 12 Earth/CABAN, Kin 77, is a Portal Day that magnifies our experience through a thinning of the veil. Portal Days activate our gifts of Intuition and Knowing. Corresponding with Tone 12’s energy of Understanding, today’s Portal offers potential for a major new Revelation. Master Number 77 doubles and amplifies the energies of Number 7, which relates to all our ways of Understanding – inner- wisdom and intuition, contemplation and discernment, understanding of others, inner-strength and tenacity, learning and education, empathic and psychic abilities, endurance and determination, spiritual enlightenment, development and spiritual awakening, and Divine life purpose. Number 7 also relates to good fortune (77 doubles and amplifies). Earth/CABAN is the Day Sign of Movement and Mother Earth, as the source of all Human Knowledge. The Kiche interpretation of No’j (CABAN) is Knowledge. the 3 circles on the No’j glyph represent 3 areas of Wisdom of 3 dimensional realms. The Aztec sign, the Ollin, is placed at the center of their calendar as an apex of movement, that points to 20 important positions of movement. Ollin simply represents “Movement,” the first sign of Life. The Cherokee Heron is also a sign of movement, as a creature that lives its life as a perpetual migration. The Heron is also related to the Phoenix, born again, from the ashes of its past. On such a day of Signs and Wonders, we could anticipate to be Born Again from Higher Wisdom that comes as a Revelatory Experience. 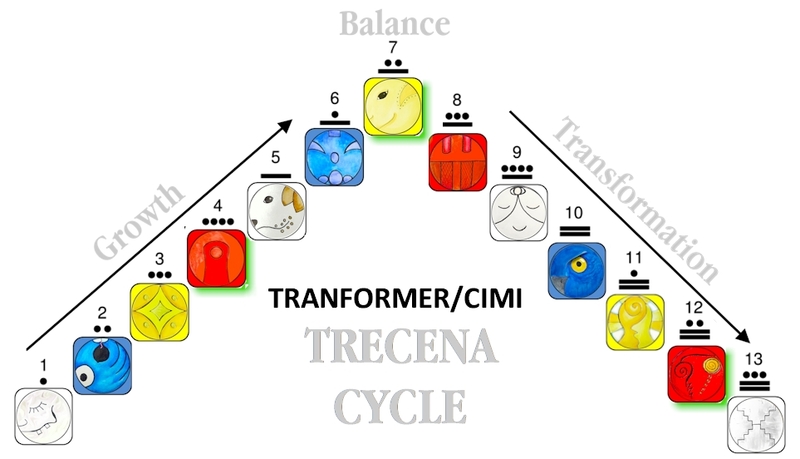 The Major Change of the Transformer/CIMI trecena comes as a new Understanding of our Experience on Earth. Earth/CABAN is the Day Sign that draws our awareness to our Oneness with Mother Earth as a body in motion. The Aztec Ollin interprets this day as “good for the active principle,” and “not so good for the passive principle.” We are called to invest something of our Self in forward movement. Again, we could see relate to the call to actively imagine what we Dream. We would be discouraged from simply adopting the discernment of outer influence, but instead, to see something for our Self. Today OUR OWN TRUTH, will be our most important Understanding. Tone 11 offers the Gift of Retrospection. We could begin by realizing Retrospection for the Spiritual Gift that it is. We overlook this as a Gift of Supernatural Power, rarely considering that Human is the only Creation of God that was given this ability to re-experience the different times of our life. Led by the Transformer/CIMI, the midwife, our role is to See into the Future. Through the chaos of major life change, we will find our Comfort through the pain of our new birth, by holding the vision of the Blessing that is in progress. Let us focus on the Miracle of our own Birth of New Spirit, turning away from the Fear of an Illusion that could be presented by the outer world. Seasons change in synchronicity with the Earth’s pattern of movement, and so are we changed by earth’s pattern of movement. The Equinox presented an equal balance between lightness and dark. We stand at a tipping point of personal power. We are capable to empower a Shift through an Intention to lean to the side of our Personal Power… leaning toward the Light. We are Blessed by the energy of a Descent and the Unseen Power of Divine Intervention, like the gravity that draws us toward the Earth. We don’t have to rely wholly on our own Power… just the Choice of our own Free Will. Our Transformation of Truth will run its Natural Course with the help of Divine Agency and in accordance with a Divine Plan. By the Forces of Nature we are synchronized with the Movement of our Mother. Today IS a day to Look to the Heaven, the place where we can see the evidence that Earth and Human are One in our movement through the heavens. Today is a day to Acknowledge the Place Humanity Shares in the Universe. We can acknowledge that everything we Know, and everything we need to live in a good way was given by Mother Earth. For all that She’s endured to Birth our New Consciousness, today is a day to Give Something Back. This is a day to make an Offering of Retrospection and Acknowledgement of the Gifts of Mother Earth. To all my relations, may we exercise our Power of Creation and the Movement that Brings Life to a Dream. Like Earth that is perpetually Turning, may we fall into sync with the correspondent movement of turning within. May we Discern the Higher Understanding to see beyond the unknown, to Imagine our Movement, following a natural course to the Creation of our Dream. Our Spiritual Aspirations are wholly aligned with a Divine Plan that was Intended by the Creator the day we were first born. this is much better than the gloomy things people were speaking about this day.